I get bored sitting in a blind, but sometimes it pays off. I have lots of berms decorated with stumps of various sizes on my property and this year a pair of Flickers made their nest hole in one of my stumps. I set my pop-up blind up soon after the female started sitting on her eggs and by the time that the young were sticking their heads out, the adults had accepted the blind as part of the environment. They had already accepted me as part of their environment, or they wouldn't have made their nest hole right where I walk by every day. 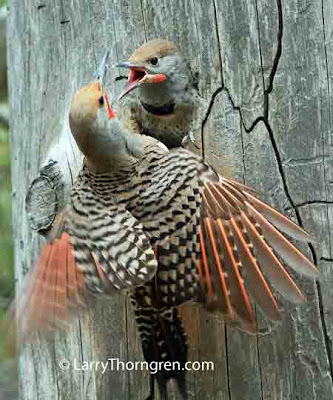 I caught this male flicker just as he landed to feed one of his male offspring. The Flickers seemed to have found an an inexhaustible supply of large black carpenter ants that they constantly brought in their crops to feed their young. Flickers lay beautiful pink eggs. This pair had six of them, that I could see with a flashlight when the female left the nest occasionally.